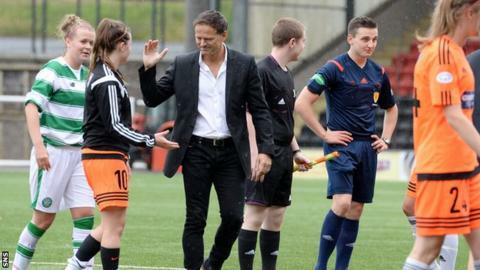 Scott Booth got off to a winning start as Glasgow City manager with a 3-0 win over Celtic. Elsewhere Spartans came out on top in a nine-goal thriller, defeating Rangers 5-4. Hibernian kept up the pressure on leaders City with a 2-0 win over Aberdeen. In the bottom six, Forfar beat Hutchison Vale 2-1, Stirling defeated Hamilton 2-1, and Hearts were 3-0 winners away to Inverness.